Создайте свою WEB страницу несколькими кликами! Просто перетаскивайте объекты на нужное вам место и все! 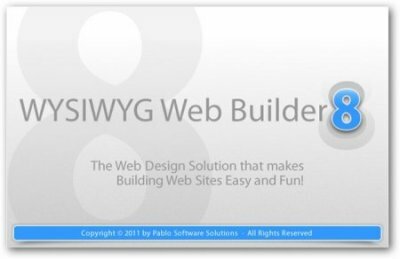 WYSIWYG Web Builder - это очень удобная программа для создания веб-страниц по принципу WYSIWYG (что вижу, то и получаю). Сама программа автоматически создает HTML-код. Вам остается только разместить объекты на WEB-страницах. Работает легко, быстро и качественно. No HTML web design knowledge required, build sites as easy as Drag & Drop! • "One Click Publishing" No FTP program needed. No special hosting required, use with any Hosting Service! • Many cool jQuery features: Accordion, Tabs, animations, AutoComplete, Dialog with ThemeRoller support. • Template support. Already more than 100 free templates available. • Blog with built-in RSS feed. • Unique extension (add-on) system with lots of extensions to make Web Builder even more powerful. • Already more than 250 extensions available! • Version 7.0 has more than 150 new features and improvements, please read this announcement for all the details. • Site Search, easily add site search functionality to your website. • News Viewer object. Display RSS feeds (local or from another website), Twitter messages, Flickr images, Myspace blogs etc. • RollOver Text, displays a text banner over image on mouse over. Includes cool slide and fade effects. • Flash Movie Player with support many video formats. • Curved Text, draw text along a (user defined) curve. • Many Web Builder objects now support cool animation effects. • State-of-the-art form validation: Uses Info balloons instead of message box, real-time validation. • More than 25 new image effects! • Added WaterMark tool to image with many options! Protect your copyright protected images was never easier. • Added the ability to merge multiple objects into a single image! Useful for merging multiple (layered) shapes into a single image. • • • Merged objects can later be split up if you wish. • Automatic backup option. Makes a backup copy of your project every 5, 15, or 30 minutes. • Added the ability to store form data in a MySQL database. • Added ability to quickly insert Facebook, MySpace, Twitter or YouTube links to Ready-to-use-scripts. • Added 'Photo Album/Slideshows on Flickr/MySpace/Picasa' to Ready-to-use-scripts.